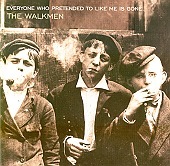 Dark, sophisticated rock aired out with a light indie rock draft, The Walkmen's Everyone Who Pretended To Like Me Is Gone is a cold, shivering record that barely holds it together. Vocalist Hamilton Leithauser sounds as if he's both bored and comfortable, capturing a laid back, settling style to both the songs and his voice. The band delivers rock music on the outer edge of rock, soft and tangled, creeping up on you and ready to explode, but backing down at the last minute to become reclusive and hidden from the listener, giving the music its dark, mysterious side that shines through everyone else. But what is most prevalent about the album is the pop, sheltered and ignored, it makes its way to the front of the room and propels the eerie, loose songs to their destination without hesitation. This is powerful stuff; I'll give it an A-.